Woody Allen has been a prolific filmmaker throughout his career and he’s given us a few classics, but in recent years it’s became less frequent to get a genuinely good film from him. His latest effort, ‘Wonder Wheel’, feels particularly tired and old, the work of someone trying to recapture their earlier glories but ending up producing something woefully dated that feels like a relic from a bygone era. Set in Coney Island in the 1950s, it tells the story of Ginny (Kate Winslet), a waitress in an unhappy marriage whose affair with a local lifeguard (and narrator, played by Justin Timberlake) is interrupted by the arrival of her husband’s (Jim Belushi) estranged daughter (Juno Temple). There are a couple of good performances and a couple of bad ones, but it’s mostly the boring, tired script that lets ‘Wonder Wheel’ down. Temple and Winslet are the good performers, although the story of a woman unravelling was told much better in 2013’s ‘Blue Jasmine‘ with Cate Blanchett. I never really bought into the love triangle that drives much of the plot, partly to do with the miscast Justin Timberlake’s stilted performance but more so to do with the stagey direction that makes it all feel like a bad play. Jim Belushi is given some of the heavier material as Ginny’s unwitting husband and he’s simply not a good enough actor to make the material work and I really couldn’t get on board with the narrative. I did enjoy the appearance of former Sopranos stars Tony Sirico and Steve Schirripa as a couple of mobsters (what else?!) although they feel mostly superfluous to the overall plot. 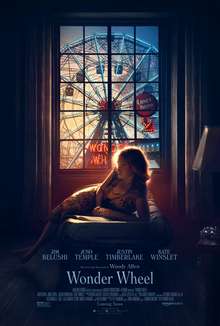 ‘Wonder Wheel’ is a disappointing Woody Allen effort that wastes a couple of committed displays from Kate Winslet and Juno Temple in a story that I never found particularly engaging.